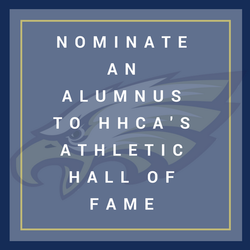 The Hilton Head Christian Academy Athletic Hall of Fame was created in 2015 to honor athletes, coaches, administrators and other supporters who have been instrumental in our school’s athletic success. Fourteen members were inducted into the inaugural class. Classes will continue to be inducted every two years. Nominations can be submitted at any time for future consideration, however, candidates must have attended Hilton Head Christian Academy for two years and be a graduate of Hilton Head Christian Academy. Nominees also must be at least five years removed from graduation of Hilton Head Christian Academy. Members of the Hall of Fame represent over twenty years of athletic success and are honored on the Hall of Fame display in the foyer outside the I-Lab.